C is for compassion. The sympathy and concern for the welfare of others. Mother Teresa showed the truest form of compassion. Giving her life for the protection of others. It was her calling. I work with a group of people who are trying to make a difference in the lives of people in the community. We are a service organization giving a hand up not a hand out. We do not have the finances to give people money, what we try to give them is dignity. We work with them to straighten out their finances and make a budget, we help the get additional schooling they might need to advance in the world, and we work with another mission group who does home repairs so, their houses are safe to live in. For me this is about helping someone else. It is not me passing judgement or pushing my values on someone else. I have learned the people I work with have a deep sense of value and appreciate hard work. Most just don't know where to turn for help. Some get assistance from the state, most do not. Pride does not allow for them to accept something for nothing. Compassion is doing something to make a difference for someone who is struggling. 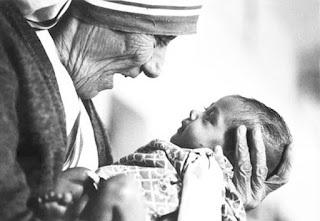 Not everyone can be Mother Teresa, but what small thing can you do for someone else?